Littleton is a town in Grafton County, New Hampshire, United States. The population was 5,928 at the 2010 census. 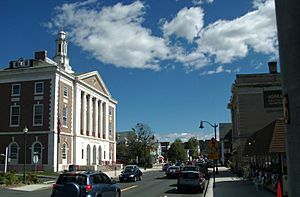 Situated at the edge of the White Mountains, Littleton is bounded on the northwest by the Connecticut River. The primary settlement in town, where 4,412 people resided at the 2010 census, is defined as the Littleton census-designated place (CDP), and is centered on the intersection of U.S. Route 302 with New Hampshire Route 116, along the Ammonoosuc River. Called Chiswick (Saxon for "Cheese Farm") in 1764, the area was settled in 1769. The town was part of Lisbon until 1770, when it was granted as Apthorp in honor of George Apthorp, head of one of the wealthiest mercantile establishments in Boston, Massachusetts. The land was later passed to the Apthorp family's associates from Newburyport, Massachusetts, headed by Colonel Moses Little. 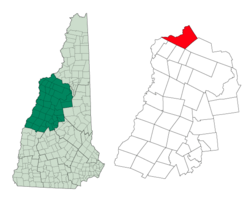 Colonel Little held the post of Surveyor of the King's Woods, and the town was named in his honor when it was incorporated in 1784, the same year New Hampshire became a state. Located along the banks of the Ammonoosuc River is the Littleton Grist Mill. The historic mill first opened in 1798, and has been fully restored to its original appearance. Between 1867 and 1909, the local Kilburn Brothers factory published photographs, stereoviews, and sold stereoscopes, double-picture viewers popular in the Victorian age. According to the United States Census Bureau, the town has a total area of 54.1 square miles (140.1 km2), of which 50.1 square miles (129.8 km2) is land and 4.0 square miles (10.4 km2) is water, comprising 7.41% of the town. The main village of Littleton, a census-designated place, has a total area of 8.6 square miles (22 km2), of which 0.12% is water. Littleton is drained by the Ammonoosuc River. The Moore Dam on the Connecticut River forms Moore Reservoir in the north. The highest point in the town is the summit of Towns Mountain, at 2,203 feet (671 m) above sea level. As of the census of 2010, there were 5,928 people, 2,673 households, and 1,596 families residing in the town. The population density was 118.3 people per square mile (45.7/km²). There were 3,065 housing units at an average density of 61.2 units/sq mi (23.6 units/km²). The racial makeup of the town was 96.2% White, 0.4% African American, 0.3% Native American, 1.0% Asian, 0.5% some other race, and 1.6% from two or more races. 1.9% of the population were Hispanic or Latino of any race. There were 2,673 households, out of which 26.9% had children under the age of 18 living with them, 43.5% were headed by married couples living together, 11.8% had a female householder with no husband present, and 40.3% were non-families. 33.1% of all households were made up of individuals, and 13.5% were someone living alone who was 65 years of age or older. The average household size was 2.21, and the average family size was 2.77. In the town, the population was spread out with 21.4% under the age of 18, 7.4% from 18 to 24, 23.3% from 25 to 44, 30.8% from 45 to 64, and 17.6% who were 65 years of age or older. The median age was 44.1 years. For every 100 females there were 90.7 males. For every 100 females age 18 and over, there were 88.2 males. For the time period 2007-11, the estimated median annual income for a household in the town was $45,290, and the median income for a family was $50,921. Male full-time workers had a median income of $40,745 versus $32,972 for females. The per capita income for the town was $24,673. 7.5% of the population and 4.5% of families were below the poverty line. Out of the total people living in poverty, 7.9% were under the age of 18 and 10.1% were 65 or older. As of the census of 2010, there were 4,412 people, 2,013 households, and 1,154 families residing in the main village, or census-designated place, of Littleton. The population density was 519.1 people per square mile (201.5/km²). There were 2,253 housing units at an average density of 265.1 units/sq mi (102.9 units/km²). The racial makeup of the CDP was 96.1% White, 0.5% African American, 0.2% Native American, 1.0% Asian, 0.5% some other race, and 1.6% from two or more races. 2.1% of the population were Hispanic or Latino of any race. There were 2,013 households, out of which 27.5% had children under the age of 18 living with them, 39.2% were headed by married couples living together, 13.8% had a female householder with no husband present, and 42.7% were non-families. 35.8% of all households were made up of individuals, and 14.9% were someone living alone who was 65 years of age or older. The average household size was 2.18, and the average family size was 2.78. In the CDP, the population was spread out with 22.3% under the age of 18, 7.6% from 18 to 24, 23.4% from 25 to 44, 29.0% from 45 to 64, and 17.7% who were 65 years of age or older. The median age was 43.0 years. For every 100 females there were 87.3 males. For every 100 females age 18 and over, there were 83.2 males. For the period 2007-11, the estimated median annual income for a household in the CDP was $42,364, and the median income for a family was $51,610. Male full-time workers had a median income of $42,756 versus $33,346 for females. The per capita income for the CDP was $24,562. 8.8% of the population and 4.8% of families were below the poverty line. Out of the total people living in poverty, 9.0% were under the age of 18 and 12.8% were 65 or older. 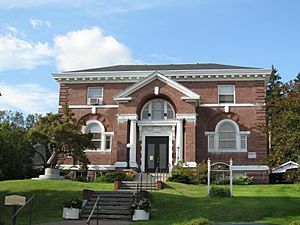 The center of Littleton is accessible from three exits of Interstate 93, and a fourth exit serves the western end of town near the Vermont border. U.S. Route 302 runs east–west through the town center as its Main Street. As of January 2006 Littleton is also served by a public transportation bus route connecting with Whitefield and Lancaster. Littleton, New Hampshire Facts for Kids. Kiddle Encyclopedia.